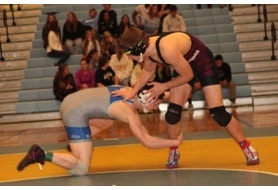 220 lb Del State Champ match. You don't see this very often with the BIG guys. 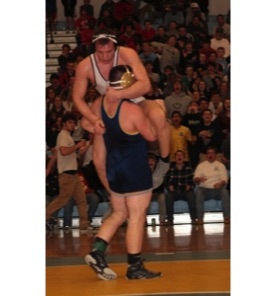 Cape Henlopen's nationally ranked Thomas Ott lifts Salesianum's John Miller enroute to a 10-4 victory. Willie Davis from Woodbridge left gets the ankle pick on Josh Smith from Appoquinimick. Willie won this 152 lb. Delaware State Championship match 14-6. Caesar Rodney's Zack Parker pins Cape Henlopen's Nick Carroll in 58 seconds for the Del 285 lb championship. Zack pinned all 4 opponents in a total of less than 4 minutes. Smyrna's 106 pounder Chase Archangelo scores back points on Caesar Rodney's Nick Klink. Nick won this Del State championship match 3-2 with an escape in the last 10 seconds. 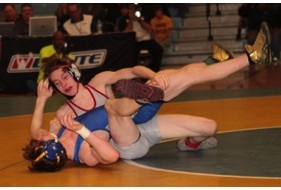 Nationally ranked 120 pounder Brent Fleetwood bottom from Smyrna scores more back points on Sanford's Luke McDonough. Brent was victorious by tech fall 15-0 in 1:48 and was voted the meet's outstanding wrestler for the second year in a row.